We get a lot of clients asking how to get those ‘washboard abs’. Unfortunately you can’t just do ab work in the studio and magically walk out with flatter tummies. We wish!! Get enough sleep – quality sleep is equally important as diet and exercise for managing or losing weight. When you are sleep deprived, your fat cells become groggy, and cannot function well, struggling to respond to insulin. What’s more, we tend to reach for high sugar/fat foods when we’re hungry, which increase insulin as well. Essentially, the more sleep you get, the more fat you will burn and the more effective your diet and exercise regime will be. Aim for at least 8 hours each night. Take a probiotic – maintaining healthy gut bacteria is very helpful when you are trying to lose weight or maintain a healthy weight range. 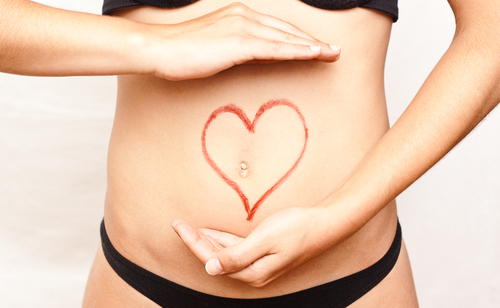 Probiotics can help improve your digestion, heart health and immune function. You could choose to take a supplement, or find good probiotics from consuming certain fermented foods. The new Kombucha drinks are a great example of this if you haven’t tried one yet! Yoghurt is also a great source of probiotics, but make sure you stick to natural yoghurt to avoid the increase sugar that’s found in most flavoured yoghurts. Diet – This is an obvious one but can be the hardest for most people. Cutting out sugar and alcohol will see a reduction in belly fat, coupled with picking lower GI carbohydrates. Check labels of food for hidden sugar, it might shock you the foods your eating that actually contain a high amount of sugar. Why not try a week without alcohol? Then two? www.gisymbol.com is a great tool for understanding which foods are actually low GI, and therefore slow releasing insulin foods, as well as some suggested recipes. Keep moving – Exercise is of course important for shifting weight. Pilates is great for lengthening and strengthening our muscles, which in turn aid in the visual body we are looking for. Importantly also, as we get older, muscle mass typically diminishes, while fat increases. Continuing to incorporate strength/resistance training in your weekly schedule will help to prevent these diminishes. Reduce stress – chronic stress can be a significant cause of belly fat. Our body responds to stress by producing more cortisol, a hormone that causes you to retain fat as a response to the threat your body thinks it’s experiencing. Unfortunately, this fat can also be very dangerous, as it often manifests as visceral fat, the fat that gathers around your internal abdominal organs that is linked to heart disease, diabetes, and cancer. Identify stress points in your life – could you avoid these, or learn ways to minimise your stress when responding to these? Learning breathing techniques, or attending a meditation class have been a couple of ways that we’ve learnt to manage stress, and adjust our response to certain situations. With the lastest health and wellness news. Subscribe today.